For traditional investor-owned utilities (IOUs) in Florida, corporate policy remains keyed on maximizing electricity sales and effectively justifying construction of new generation resources that are a high source of profit for stockholders. As regulated monopolies, IOUs are guaranteed a profit by the public service commission (PSC) both for selling electricity and associated transmission lines, but particularly for building power plants. And Florida with its fast-growing population and thus expanding residential sector with high levels of cooling electricity use has guaranteed the need for new power plants. As such, the state has been a gold mine for its IOUs in the state — the average household spends nearly $2000 annually for electricity. With millions of accounts, this is a multi-billion-dollar revenue stream. Figure 1: Florida at night as seen from International Space Station on Oct. 13, 2014. Lighting electricity use is fundamental. What about future clean generation resources? Until recently, Florida utilities have attempted to expand nuclear projects, which have no carbon emissions, but siting has remained a vexing issue. However, it has been cost overruns that have been the real nuclear power show stopper. Economist Mark Cooper has argued for the last decade that Florida has misread the evolving electricity market. A senior fellow for economic analysis at the Institute for Energy and Environment at Vermont Law School, Cooper had warned 10 years ago that the state’s nuclear development strategy was not economically optimal. Cooper cautioned that power from new nuclear plants would cost $0.10 to $0.12/kWh while Georgia regulators were producing electricity from solar PV farms for half as much. And there are planning risks. Duke Energy Florida customers are still paying $1.5 billion for the Levy County nuclear project that was cancelled. It will never generate a single kWh. FPL still pursues plans to build nuclear power plants Turkey Point 6 and 7 (2,234 MW) at its 3,300 acre complex near Homestead, Florida. And plans continue even though the company that was to build the plants, Westinghouse, has filed for bankruptcy. As of May 2017, FPL was uncertain as to the cost of the anticipated plants and whether they would even be cost effective when potentially brought online years from now. However, an arcane provision in a 2006 Florida law allows utilities to shift the financial risk of building reactors from its shareholders on to its customers. Thus, the power company can recover all its pre-construction costs to its customers. Moreover, if it abandons construction of the project at any stage, it can recover costs and profit from the costs already incurred. Currently, FPL spends $25 million a year associated with licensing from a project which may not be cost effective. FPL has yet to do an annual economic feasibility study for the project, but it seems unreasonable to expect consumers to continue to pay for something that may not be needed or ever built. However, Florida’s IOUs are not necessarily uniformly antagonistic to the goals of producing power from clean sources. On the contrary, FPL president Eric Silagy has endeavored to reduce use of outmoded coal generation in the state. A good example is the termination of the 250 MW Jacksonville Cedar Bay coal-fired plant – citing the rationale as both “preventing emissions and cutting costs to its 4.7 million customers.” Investments since 2001 in high-efficiency natural gas generation have enabled cuts to both fuel oil consumption as well as coal. More recently in 2017, FPL filed plans to shutter a third uneconomical coal-fired plant at the St. John’s River Power Park. And FPL remains committed to repowering its older power plants with state-of-the-art combined cycle power plants which are exceedingly efficient. In any vision of a cleaner energy future, these are certainly positive developments. However, the IOUs are not particularly warm towards acknowledging the importance of reducing greenhouse gas emissions unless it suits the bottom line. As example, in a meeting in May 2016, shareholders at NextEra, FPL’s parent company, successfully voted down a mandate to annually review the risks and costs of sea level rise on its operations. Still, given the world situation and greenhouse gas emissions — still accelerating in 2017 — the decision to ignore as corporate policy seems backward. Given evidence of accelerating global warming, it is only a matter of time until the entire world — every nation — is focused on the issue to prevent further loss of coastlines, more extreme weather, and devastation to agriculture resulting in prospects of famine. Not only is Florida backward relative to rooftop renewable energy, there are existing state-sanctioned laws to keep it that way. For instance, Florida, unlike the other most populous states in the U.S. — even Texas — has no renewable energy performance standards (RPS), which would set a goal for the state in terms of the future goal for generating more of its power from renewable energy. Even more importantly, third party sales are illegal, such as those offered from solar leasing programs (SolarCity, Sunrun, and Vivint Solar being the biggest solar leasing companies in the US) are illegal. This means that homeowners would have to come up with $10,000 to $20,000 to install solar for themselves — a barrier so effective that just a year ago there were fewer than 20,000 solar electric residential PV installations in the state. Florida’s anti–rooftop solar and anti-efficiency policies are fervently guarded in Tallahassee by a powerful lobbying presence from the utilities. Florida Power & Light is the largest of the regulated utility monopolies in the state. As the nation’s 3rd largest IOU, it has nearly 5 million customers. In 2016, it turned a profit of $1.6 billion — over $300 per year per customer. At the same time, it asked the PSC for additional rate hikes of $1.3 billion. In the end, the PSC awarded approval for of a rate hike of $811 million from the request. This will see the average cost of annual electricity in Florida for the average home increase by $120 a year by 2019. Although IOUs may not obtain the magnitude of rate hikes requested, profits are essentially assured. That’s hardly a free market and no wonder that investors often seek haven in IOU investments which are essentially guaranteed. Meanwhile, FPL along with the other of Florida’s IOU utilities spent most of 2016 dumping nearly $20 million into a failed campaign to deceive voters to support a scandalously worded ballot initiative called Amendment 1. Had it passed, the amendment would have forbidden third-party solar sales and made that part of the state constitution. The other bedfellows contributing cash to the failed amendment? Edison Electric Institute, the Koch Brothers, and ExxonMobil. Has FPL or the other IOUs in Florida obtained all the cost-effective energy efficiency available in the state? No, not by a long shot. In research from 1995–2016, we have demonstrated the real-world ability to cut electricity use by 30–40% in Florida homes often just by choosing the right technologies. We’ve also learned how to reduce cooling by 50% or more – even in existing homes. At the same time, solar electric grid-connected PV systems have turned out to be reliable and productive, with the prices of systems dropping in half in just 3 years. Rapidly advancing home battery systems now promise utilities the potential of distributed electrical storage while allowing homeowners with rooftop solar the possibility of uninterrupted power after a storm. With its hot and humid climate, air conditioned homes in Florida use a lot of electricity. In fact, the state’s average household electricity consumption is second only to Texas as largest in the nation. Population wise, Florida has about 20 million residents, making it the 3rd most populous state. The natural gas distribution network is sparse relative to many other regions of the U.S. and air conditioning in the state makes it one of the most intensive energy-using regions in the nation. Electricity makes up more than 90% of the residential energy sales in the state. The average single family home in Florida uses about 15,000 kWh per year — about twice that of homes in California. Homes which use a lot of electricity are very lucrative for IOUs. For decades, with a burgeoning population and centrally air conditioned houses steadily growing in size, the plans approved by the state public service commission necessitated ever more out of state coal plants and in-state natural gas combined cycle power plants. In contrast, the citizens of Florida remain steadfastly in favor of greater energy efficiency and solar in one survey after another. An obvious question: how has the PSC allowed the investor owned utilities to override the interests of the citizens of the state? In any case, in March of 2017, in response to vocal opposition from its ratepayers, Gulf Power rescinded the plan to raise its fixed charges. Ironically, Gulf Power comes off better in its efficiency programs than does much larger FPL. And in an illustration of the importance of regulation, Duke Energy Florida, while superior to FPL in its efforts toward energy efficiency — is far less effective at promulgating efficiency programs than Duke Energy in the Carolinas, where state regulators provide greater incentives. The key lesson is this: without motivating incentives from regulators, investor-owned utilities, with profits still linked to sales, will not seek to most effectively reduce the energy consumption of its ratepayers. What happens when population growth and household electrical demand falters so that it becomes difficult to argue for building lucrative new electric generation resources? That’s precisely what happened with the recession of 2007–2008 when the normally robust growth rate of people moving to Florida declined from over 350,000 persons per year to just 219,000 persons in 2010–2011. During the height of the recession (2006–2009), the growth rate fell to a low of only around 100,000 persons per year. At the same time, electricity consumption per household fell as well. With the improving economy, population growth has resumed. However, it still remains only about 60% of the growth rate prior to the recession, although a sudden spurt took place in 2015 when the state’s population rose above 20 million persons. Still, in 2016, even with a robust state economy, the decline in household energy use continued — and in contradiction to the 2015 FPL forecast. Given continuing efficiency improvement in heating and cooling equipment, appliances, and lighting, there is a real question as to whether household electricity consumption will return to levels seen at the turn of the century. 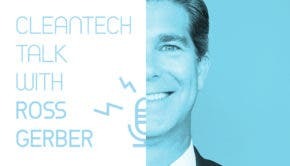 However, a strong caveat to this assessment is the potential for an increasing preponderance of electric and plug-in hybrid vehicles in the next 30 years. Although Florida’s IOUs remain covertly opposed to more efficiency and rooftop solar, they are all-in on plug-in hybrids and electric vehicles (EVs). Why? EVs build load. And realistically, EVs have some large potential benefits to Florida homeowners via vehicle-to-home (V2H) technology using their big batteries. We will cover that later. In the summer of 2015, the IOUs in Florida belied their true colors by quietly asking the Public Service Commission to largely end their energy-efficiency programs. However, the move was not silent enough and the major Florida newspapers soon learned that the utilities were asking to discontinue these popular programs. Unlike many other expensive investments such as solar PV, these popular programs adding ceiling insulation and choosing more efficient air conditioners helped people in all walks of life – even grandmother. Yet, in spite of the objections from the public, many of the efficiency programs for the Florida IOUs were scuttled and today many are largely gone. Even so, due to the federal appliance and lighting efficiency standards along with the building energy efficiency standards in the state, the huge electricity use appetite of Florida homes has started to fall. 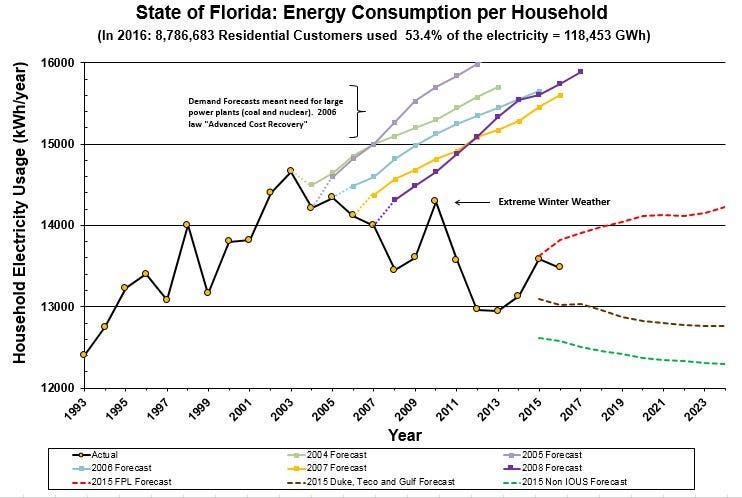 Essentially, while electricity use had steadily grown in the average household for 3 decades, the consumption trends since 2010 showed that the electricity demand of the typical Florida home had grown flat and even showed signs of declining. Part of this is undoubtedly due to the more aggressive Florida Energy Code, which an independent analysis (Jacobsen and Kotchen, 2013), revealed as saving 4% of electricity in Florida homes with more recent code level efficiencies. Then, other things that are not part of the Florida code have started to impact monthly electricity consumption. None has been larger than solid-state lighting. As lighting sources have become more efficient with compact fluorescent (CFL) and more recently LED-type lamps substituting for incandescent lamps, reductions in lighting energy use have had a larger impact in Florida, where data from our PDR project indicates substantial interaction with cooling. While FPL continues to forecast increases in per account electricity consumption, this is not true across the board. Indeed, in its 10 year site plan in 2017, the Orlando Utilities Commission (OUC) forecast that per account residential electricity consumption would continue to fall over the next 10 years, with total utility demand continuing to increase modestly with population. However, the reasons for the IOUs seeking to end the efficiency programs are not difficult to imagine. Utilities sought to end efficiency programs because they were working. Without dependable load growth in the state, the rationale asking for justification for building new power plants would fall flat in any PSC economic assessment. The PSC quietly agreed that the utilities could slash their programs, all hoping for as little attention as possible. Two commissioners, Julie Brown and Lisa Edgar dissented, but were outvoted. At the same time, one of the longtime champions of energy efficiency research at Florida Power & Light, Craig Muccio, was let go after serving in an important research role for his 33 year professional career with the utility. I had met Craig in the ’90s when we worked together on a reflective roofing project in Ft. Meyers with results that were so compelling (20% AC savings from having a white roof) that we received an award from the American Society of Heating, Refrigerating and Air Conditioning Engineers (ASHRAE). Craig was literally the braintrust of the energy efficiency research conducted at Florida’s largest IOU for almost 20 years. Within the Florida university system, there are a number of very knowledgeable researchers, like myself, Yogi Goswami and S.A. Sherif at the University of Florida, and Shihab Asfour at the University of Miami who had worked with Craig at FPL in palmier days. In the summer of 2015, we all complained loudly to FPL about cutting loose the intelligence behind their DSM efforts for the previous two decades. In spite of many appeals from the Florida energy efficiency academic community, Craig Muccio was let go and not effectively replaced. Tags: Duke Energy, Duke Energy Florida, Florida, Florida utilities, FPL, nextera, NextEra Energy, Utilities, What About Florida?